Brazil's main leftist party said Saturday it's sticking with former President Luiz Inacio Lula da Silva as its presidential candidate even though the electoral court has thrown him off the ballot for an election just five weeks away. Da Silva's vice presidential running mate, former Sao Paulo Mayor Fernando Haddad told reporters the Workers Party will continue pushing to somehow get da Silva, 72, who easily leads in the polls, back on the ballot. "The people are sovereign regarding the party's candidate. And that candidate is Lula," Haddad said. That strategy would keep da Silva in the spotlight until the absolute last minute, perhaps rallying support from backers that could then be transferred to a stand-in, likely Haddad, who is much less popular or charismatic. The electoral court voted 6-1 early Saturday to reject da Silva's candidacy because of a corruption conviction that has been upheld on appeal. Da Silva and the party are appealing both the conviction and the electoral court ruling. The ruling had been widely expected and there were no immediate street protests of the sort that occurred when the former president was initially arrested. Da Silva, who was wildly popular when he left office on Jan. 1, 2011, is now a sharply polarizing figure. Many Brazilians still revere him for pulling millions from poverty during his eight years in power. But he and the Workers' Party have lost much of that appeal over the last several years due to a stumbling economy under his hand-picked successor Dilma Rousseff and a sprawling corruption probe that has ensnared many top businessmen and politicians, including da Silva. That division was clear in the reaction to the electoral court ruling. "We have a big debt with Lula," said Thiago Renato, a 39-year-old IT specialist in the northeastern city of Recife. "We trust him here. I will vote for whoever he endorses because then I will know who will have the biggest impact for the poor," he added. "I know Haddad, but I don't know him well. If he is the candidate, he will have my vote." At a Sao Paulo coffee shop, Alexandre Fonseca, a 21-year-old medical student, called the court decision an "unfortunate and fully expected ruling," one unlikely to be overturned on appeal. "The party must unite behind Haddad or whoever will replace Lula, to win the elections and give continuity to his legacy," he said. But Virginia Toledo, a 37-year-old housewife in Sao Paulo, said da Silva's ouster means "we have another reason to celebrate." The former president is serving a 12-year-sentence for corruption and money laundering after being convicted of trading favors with construction company Grupo OAS in exchange for the promise of a beach house apartment. As part of the ruling, Justice Luis Roberto Barroso said the Workers' Party should replace da Silva within 10 days, and that he should not appear as a presidential candidate in free airtime that is given to political parties on nationwide TV and radio. However, the party used the first day of free campaign TV airtime on Saturday to denounce the electoral court ruling in a spot that featured filed footage of da Silva. Left-leaning candidate Ciro Gomes of the Democratic Labor Party said the electoral court's ruling was "not a good thing for Brazil." 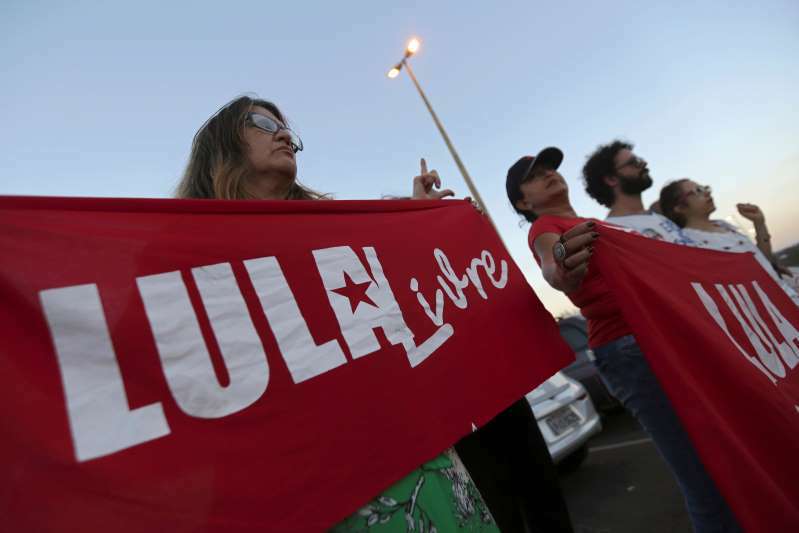 "No matter how much Lula is detested in some sectors and no matter how he is idolized in others, to prohibit the country's biggest popular leader from taking part in the electoral process is traumatic."